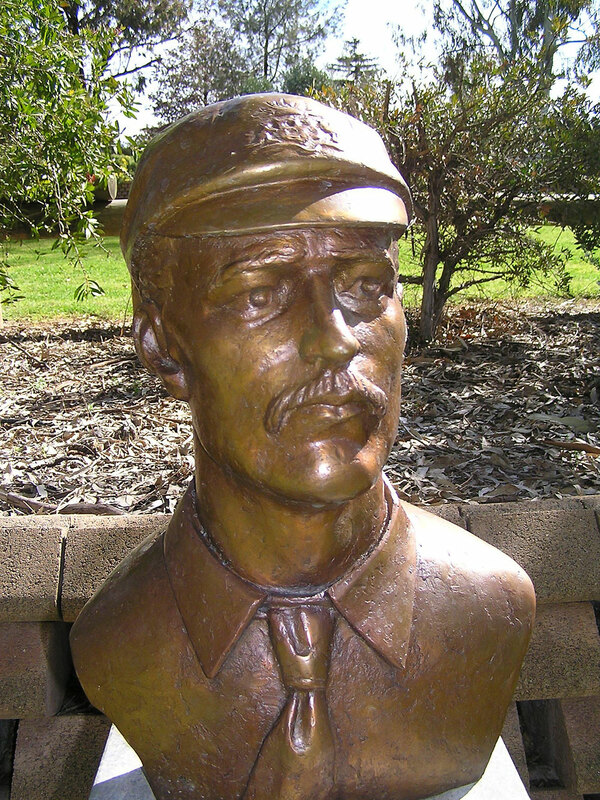 This sculpture was commissioned for the Dombroski Foundation near Mittagong, NSW. 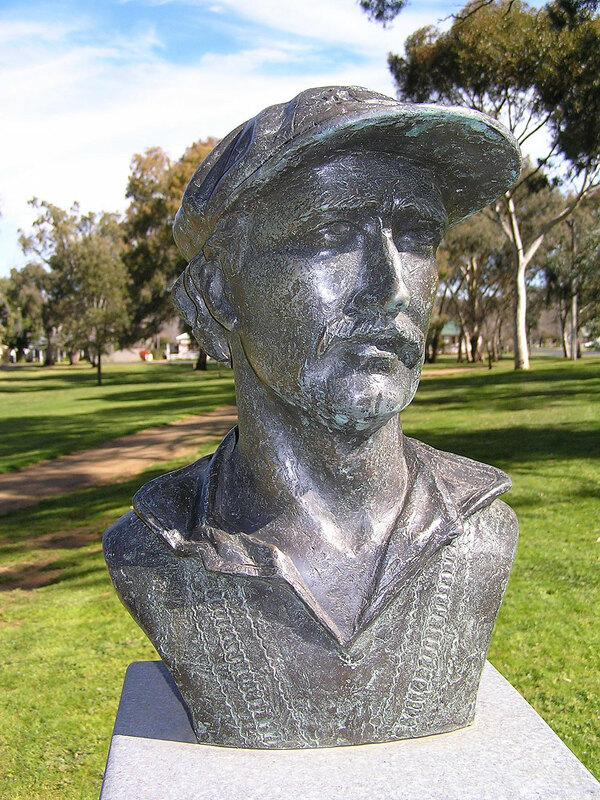 The original brief specified the inclusion of water, and was to memorialise the siblings George and Pam Dombroski who had grown and tended an organic nature on the property where the sculpture is now situated. Upon learning more of their story I made some initial thumbnail sketches which resulted in a more figurative composition than the abstract notion that was originally suggested. The clients expressed that the idea was even better than they had hoped for. A small maquette was then made and approved, which I scaled up to around nine feet high. With the help of a small team I made a twenty six piece plaster waste mould of the clay model. The mould was then transported to the site where Harmony was cast in situ from sand and cement- or reconstituted stone. The piece represents the Dombroski’s nurturing relationship with the land, and includes reference to the natural elements of earth, water, and fire. Pam holds a conch shell which spills water onto George’s hand which in turn spills the water onto the plant form below. George- an astrologer- has one hand placed on his reference book whilst looking up at the conch shell which also represents the sun. Around the base of the memorial is written “Through relatedness consciousness flowers” which is a Buddhist expression of the opening process. The foundation has grown to prosper as a residence for artists and organic farmers, and also holds regular artistic and spiritual workshops. 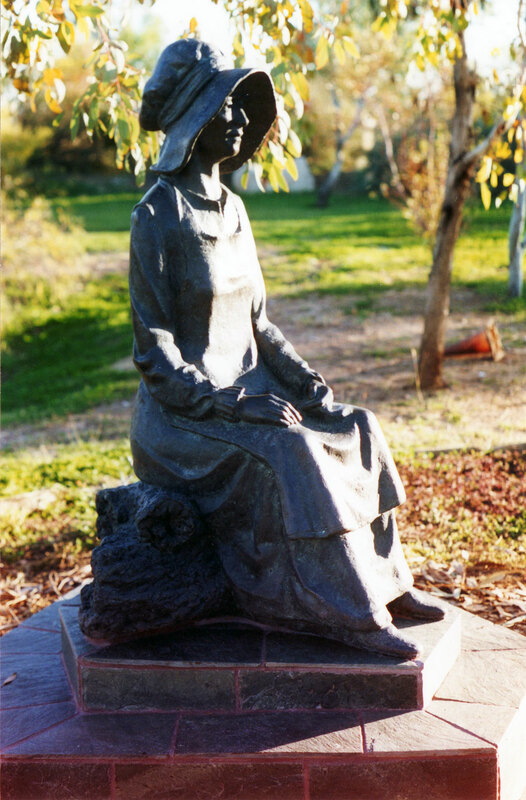 This was a project initiated by the NSW Branch of The Stockman’s Hall of Fame to commemorate the women of the pioneering era in Australia – something which was absent at the site in Longreach, QLD at the time. The brief was to create “A Quiet Place” – which portrayed the lady of the time taking a short rest from the endless chores and the harsh conditions of her unfamiliar environment. She is vulnerable, yet strong, and stares into the distance as she recalls memories from times past. I submitted an entry for the brief which included drawings for the concept and was subsequently shortlisted to produce a maquette. My maquette was selected by the committee to be developed for the full scale project. “Martha” -as she affectionately came to be known - is a little over life size at around for and a half feet, seated. She is placed on a two-tiered pentagonal plinth - tiled in green granite which was sourced from the site. Cast in bronze, she looks to the north, and the future- at the QANTAS museum in the not too far distance. 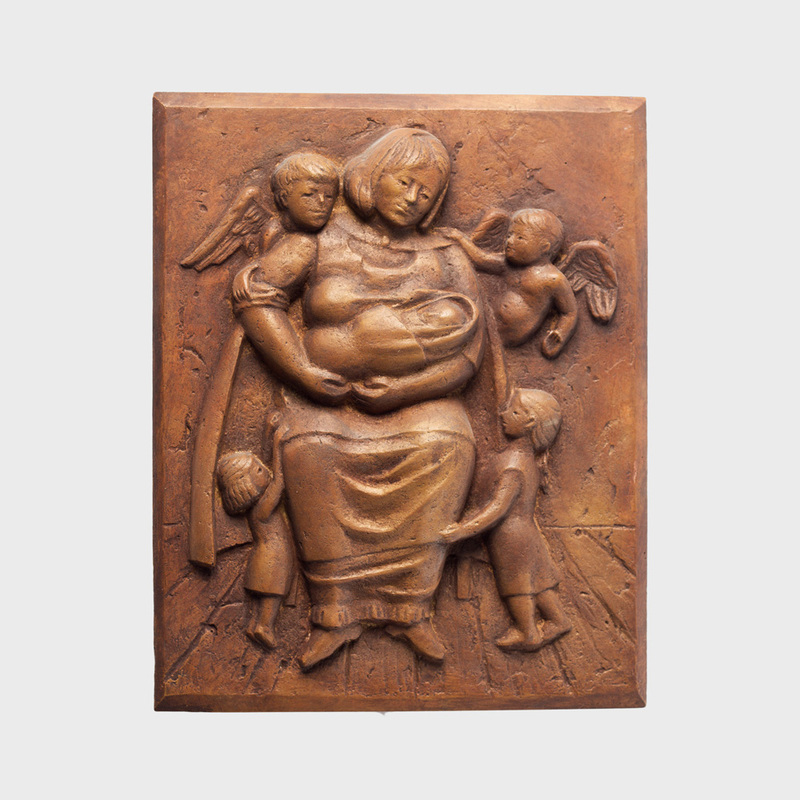 This commemorative bronze plaque was commissioned as a tribute to the life of the family’s mother who had raised her three children alone despite her own ongoing health issues. She was a devout Catholic and had an affinity for the ‘’Mary - Protector of Children” icon. In this composition she is cast into that role. Although seated, her cloak shrouds her young daughters as she cradles her infant son in her arms. Two cherubs – representing her lost children – hover near by observing the scene and offering protection. The plaque is A4 size and is embedded into a granite headstone. The design for this medallion was taken as directly as possible from the existing two dimensional logo and was “sculpturised” into a free standing relief. It was commissioned by Edmund Rice Special Education Services to commemorate a significant anniversary of the organisation. Sixty copies were cast in sandstone finish acrylic gypsum resin to be presented to contributing members. You may approach me with your specific need to develop a commissioned sculpture. 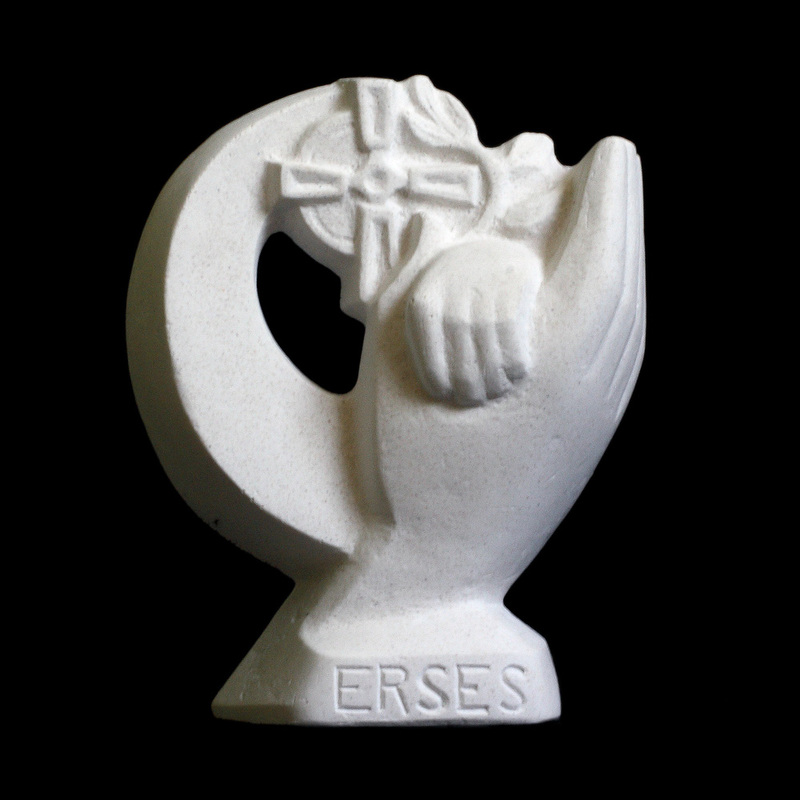 This may be to memorialise someone or something, to bring life to a concept, or to complement an indoor or outdoor space. Through a process of discussion, drawings, and maquettes, a design will be arrived upon which conveys the desired sentiment. The project can be tailored to your budget, and is satisfying to both client and sculptor as both are involved in the process of its creation.